A & J Bent Farms Ltd.
D & E Pork Inc.
J & M Reeves Christmas Greens Ltd.
For Paul Kittilsen, that was the question that started it all. Paul is not your typical farmer. Not one single dairy or beef cow can be found on the Kittilsen farm. What you will find though are bees, lots and lots of honeybees. Paul Kittilsen (class of ’89) and his wife Lori (class of ’90) own and operate a honeybee farm in the rural community of Debert, NS. They have three children, Benjamin, 13, Sarah, 11, and Ian, 8, who all grew up with a respect for the small stinging insects and a love for honey. Paul’s journey as a beekeeper started when he was just a teenager. At the age of 16, he began working on the farm of a family friend, Frank Woolaver (Class of ‘46). Never afraid to get stung, Paul quickly learned that he had a strong passion for the hard-working insects. Paul acquired his own hives at the age of 18 and started beekeeping fulltime in 1995. Today, Paul is in his 32nd year of beekeeping. The Kittilsen farm is a first generation farm, meaning Paul and Lori established it themselves. They purchased their current property in Debert in 1992 and began to build the infrastructure needed to expand their number of hives. Today the farm is a 1200 colony operation, a federally inspected honey packing facility, and a one acre cranberry bog. There are approximately 230 active beekeepers in Nova Scotia but the Kittilsen’s are one of the few fulltime beekeeping operations in the province, producing about 75 pounds of honey per hive, per year. 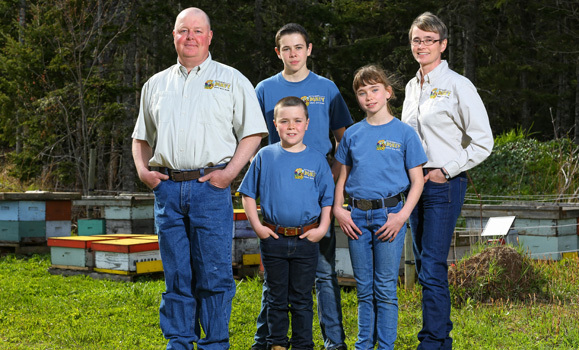 Beekeeping is a year-round task for the Kittilsen’s and no two days are ever the same. Paul works full time on the farm while Lori works for the Nova Scotia Department of Agriculture in Truro, NS. The Kittilsen’s employ two full time employees in the summer in addition to their Apiary Manager, John Stiles (class of ‘97). John has been working on the Kittilsen farm for 17 years. Tending to the bees and producing honey is seasonal. In the spring, the Kittilsen’s bee hives are sent to a number of blueberry fields around the province. The hives are rented by blueberry growers in Nova Scotia and are used to pollinate the blueberry fields. For three weeks, the bees are left to do their job in the blueberry fields pollinating the blossoms. Once the blossoms are pollinated, the bees are then transported back to their summer locations. In the fall, the honey supers are brought to the Kittilsen’s farm for extraction. The honey supers are wooden boxes in which 8-10 wooden frames are hung. The bees build their honeycomb on the frames and store their honey in the honeycombs. Once the honeycombs are full, the bees seal them with beeswax. The honey is extracted from the supers using an automated machine and placed in barrels for storage to be packaged throughout the year. Winter is a slow season for beekeeping but there is still work to be done. For the wintermonths, some of the bees are moved to the Kittilsen farm and stored inside, but the majority do stay outside. They are wrapped with black plastic and receive insulated covers to keep them warm in order to help them survive the harsh winters. Kittilsen’s don’t just sell liquid honey either. Their creamed honey and beeswax candles are also popular products that they produce on their farm. In the fall, their cranberry bog produces cranberries which they bag and sell fresh as well. with a pest called Varroa mite, a parasite that attacks the bees and can eventually wipe out an entire colony. In addition to Varroa mite, black bears and viruses are challenges for beekeepers as well. In addition to the bees, the Kittilsen’s farm is home to a few sheep, rabbits and chickens. These animals are not used for farming though. All three of their children are actively involved in 4-H and so these animals are used for showing. Not only do the children help take care of their 4-H animals, they help out with the bees as much as they can. Benjamin and Sarah can often be found on Saturday mornings at the Truro Farmers Market selling honey and beeswax products. Ian, on the other hand, enjoys the more hands-on aspect of beekeeping. For the Kittilsen’s, farming with their family is important but it’s not everything. For Paul and Lori Kittilsen, beekeeping is more than a full time job. It’s their lifestyle and they wouldn’t have it any other way.